As a baseline, look at the coronation oaths, rituals (anointing with oil, consecration) and speeches of a couple monarchs. Not sure exactly what time frame you're looking at but you might consider James VI/I's 'Basilicon Doron'. It should be available online in a variety of places. In it he writes about what he considers the king's role to be in the care of his people. Other documents you might want to look at would be some of the writings of Elizabeth I printed in 'Elizabeth I: Collected Works' Marcus, Mueller and Rose (eds.). There are poems, speeches, and letters that show how Elizabeth considered her authority as monarch. Kingship/queenship is a topic that uses analysis of how authority and power was recognized within the body of the monarch. So you can use a wide variety of sources to discuss the potency of the 'king'. I'm sure others will have more ideas for you. But just about any document that discusses the power of the monarch will give you some material for your paper. The chronicler William of Malmesbury describes Edward the Confessor touching for the King's Evil, but Henry VII could have been the first to have a special ceremony where he healed the sufferers and gave them a coin. Also, his 'Trew Law of Free Monarchies' might interest you. Hope this helps. Interesting topic - would love to know how you get on. Marilyn R - Such very good suggestions! I’ve just come upon it quite by chance when Googling (Google images) ‘Queen Mary king’s evil’, where it came up as the first reference. The whole book is online here at Project Gutenberg. 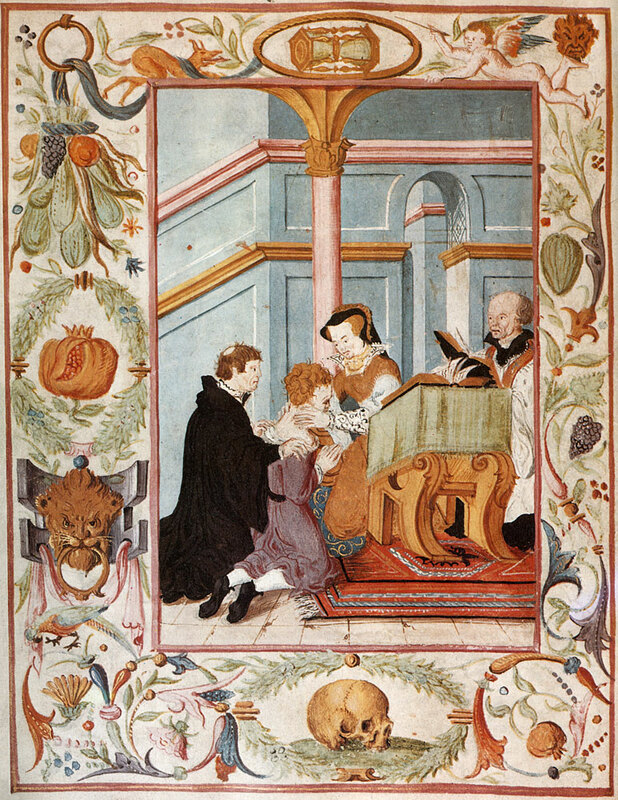 Google images also came up with the lovely decorated page showing Mary administering to a sufferer. Alas, I cannot remember where the page comes from! Perhaps you already know, or maybe someone else can help. Is this the image you're referring to Marilyn? I don't have the source at hand here at work, but I can look it up when I get home. Argh! The only credits I keep finding for the image is "Westminster Cathedral Library" but no information on which book or manuscript it originally is from. By the way, there is another illustration that I assume is from the same source of "Mary Blessing Cramp Rings on Good Friday". It might require a little deeper digging to find the original source, but I'll keep an eye out for it while I slowly work my way through putting my new image database together. Oh wow! I've been holding off checking on this for a couple of days because I was worried this was too weird a topic and nobody would reply... I shouldn't have doubted. Thank you all so much for your ideas! These are exactly what I was looking for. Lara, I went scrounging for information on the two illustrations of Mary blessing the cramp rings and touching for scrofula and found that they both come from an illustrated vellum manuscript that belonged to Mary herself. The manuscript was later owned by Cardinal Wiseman (1802-1865). I Googled "Cardinal Wiseman" and "cramp rings" and the first thing that showed up was "Proceedings of the Society of Antiquaries of London - Google Books result" I hit that and got a page describing Mary's manuscript as a manual for the ceremonies of blessing cramp rings and touching for the King's Evil. It also describes other illustrations such as the arms of Mary and Phillip. I was looking for something else in my files & I found this - any use? On-line edition including some supplementary materials, including texts removed since 1662. PREVENT us, 0 Lord, in all our doings with thy most gracious favour, and further us with thy continual help, that in all our works begun, continued, and ended in thee, we may glorify thy holy name, and finally by thy mercy obtain everlasting life: through Jesus Christ our Lord. Amen. The Gospel (for Ascension-day) S. Mark xvi. 14-20. GOD give a blessing to this work; and grant that these sick persons on whom the Queen lays her hands may recover, through Jesus Christ our Lord. Answer. That put their trust in thee. Minister. Send unto them help from above. Answer. And evermore mightily defend them. Minister. Help us, O God our Saviour. Answer. And for the glory of thy Name deliver us; be merciful to us sinners, for thy Name's sake. ALMIGHTY God, who art the Giver of all health, and the aid of them that seek to thee for succour, we call upon thee for thy help and goodness mercifully to be showed upon these thy servants, that they being healed of their infirmities may give thanks unto thee in thy holy Church, through Jesus Christ our Lord. Amen.